Preheat oven to 350 degrees. Set rack in middle of oven. Mist baking sheet with non-stick spray (or use parchment paper). 1. Whisk egg whites, sugar, almond extract, and salt in a mixing bowl until well blended. 2. Add coconut and mix thoroughly with a large fork or a sturdy rubber spatula. The mixture should be thick and sticky. 4. Bake at 350 degrees in the middle of the oven for 20 minutes, or until macaroons are golden on top and bottom. Transfer from baking sheet to cooling rack with a thin-edged metal spatula. Store in covered container for a week or store for a few months in the freezer, well sealed. Melt dark chocolate in double boiler. 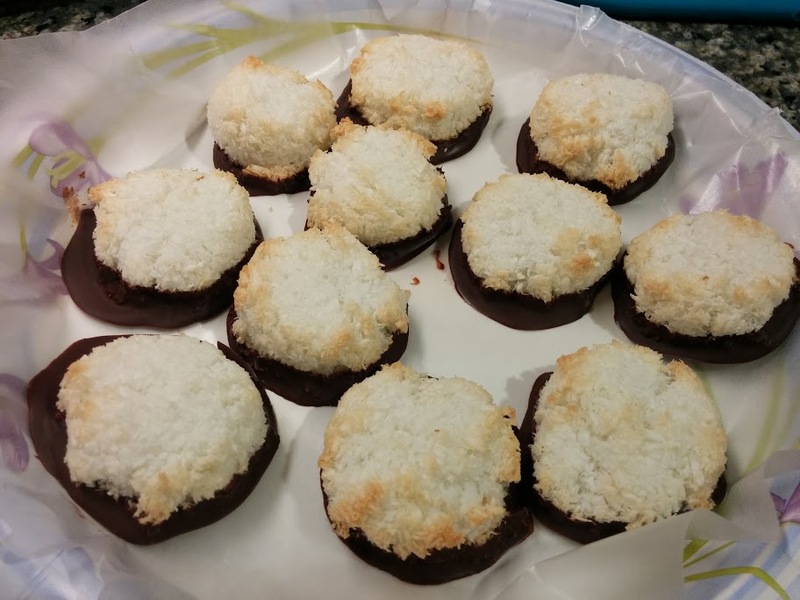 Dip macaroons in chocolate for an added treat.